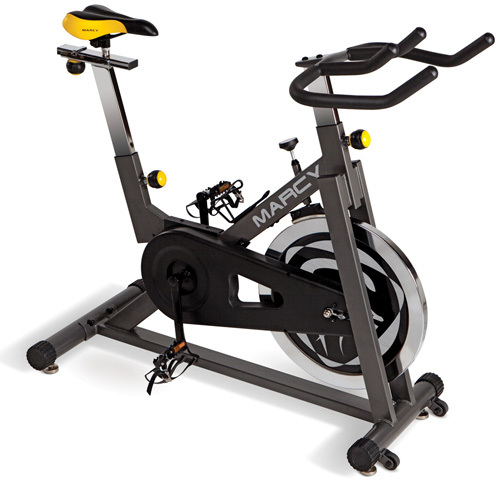 Get in the best shape of your life with this Fan Bike from Marcy! No need to pay expensive monthly gym memberships, when you can burn calories from the comfort of your own home! Improve your health, energy and overall appearance, with less of a jolt to your joints and muscles as compared to other cardiovascular training. The XJ3210 Fan Bike from Marcy offer a unique air resistance system where the faster you pedal, the greater the resistance is increased. Other features include a balanced 40 pound flywheel, adjustable chrome handlebars, road-side seat saddle, easy-to-use resistance knob, water bottle holder, bottom wheels for easy transport, adjustable seat, and fan air flow provides a comfortable and cooling effect on the user. Max weight capacity: 300lbs.